Have you ever noticed how, in the old stories, people throve on a diet of bread and water? And have you ever met a culture where bread is still a fundamental part of the daily diet? 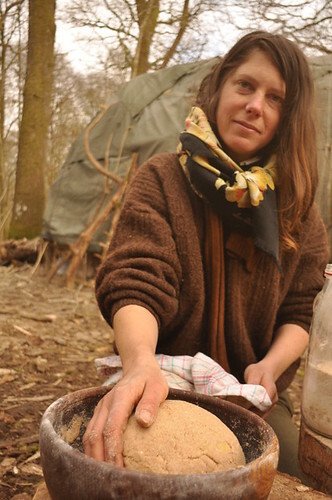 Bread was once known to be valuable in Britain, too. The very word proves it: bread-winner, your bread-and-butter, etc. So how do we reconcile these ideas of bread, against its modern incarnation, the plastic bag of thick sliced white? For bread, it seems, is not what it used to be. But the good old bread is still available, as it shall ever be. It just takes a little time, and patience, to make really good sourdough bread, which is as sufficient and strong as our ancestors would have known it. This winter, we often bolstered thin meals with hearty bread. And we learned how to make it in the oldest way, as sourdough flatbreads cooked on hot coals. 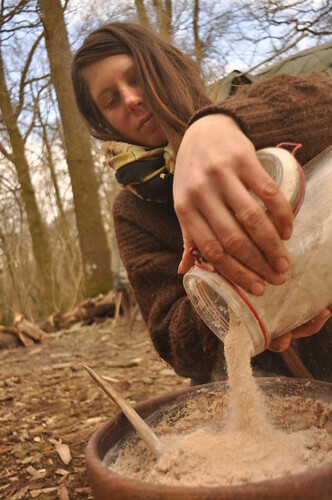 Rose and Ayla made sourdough starter cultures before our winter in the Welsh woods. 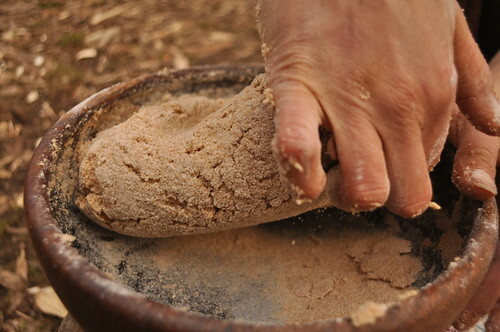 A starter culture is simple alchemy, the ingredients being nothing more than clean water, strong flour and fresh air. Simply mix equal parts of flour and water in any small ceramic or glass container. We opted for whole-wheat flour, but most flours work fine, rye being especially good. And for containers we used old jam jars, with lids left loose while the starter gets going. The mix must be covered well with a thin cloth, to keep out everything but the air. And there must be enough space in the jar for the mix to grow. Every day, a few times, the mix should be vigorously stirred, to help it breath more air, and to prevent moulds from growing on the surface. Within a few days, perhaps a week, the mixture should start to bubble. This is the beginning of fermentation, a very exciting thing. This tells us that multitudes of wild-yeasts, always in the air, have settled into the mix. These yeasties will make our sourdough bread rise, and be soft and delicious. 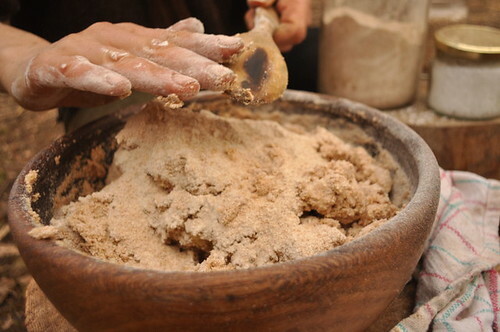 The micro-organisms which colonize our flour-water, to make the starter, are happily very beneficial to the human gut. These wild yeasts pre-digest the wheat, breaking it down to produce alcohol and carbon dioxide as by-products. The alcohol collects as a thin clear layer of liquid at the top of the starter (can be up to 15% vol. ), and the carbon dioxide bubbles through the mix to escape. When baked into bread, this alcohol will evaporate, and the carbon dioxide, trapped by the dough’s structure, will raise the bread. These marvellous yeasts, which do such good service, are the same mini-creatures that turn apple-juice to cider. They are beneficient friends. So once your starter starts bubbling, it needs feeding, a spoonful of flour every day for a few days. This will allow it to ferment further. Water should be added if the mixture gets too thick. Keep stirring regularly. When the starter seems completely bubbly, and has a sour odour, it is ready. Congratulations. 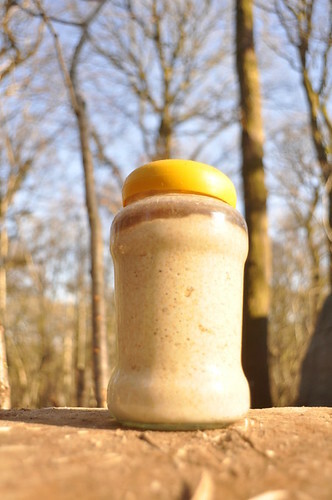 The sourdough starter, now happily active, can be used to create all manners of bread. It is simply a matter of playing around with it, to learn its temperament and potential. 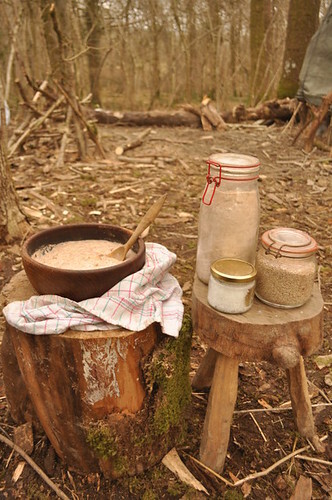 In our woodland winter routine, we frequently had big pots of porridge for breakfast. When leftovers remained, seldom very appetizing the next day, we make our old porridge into bread. 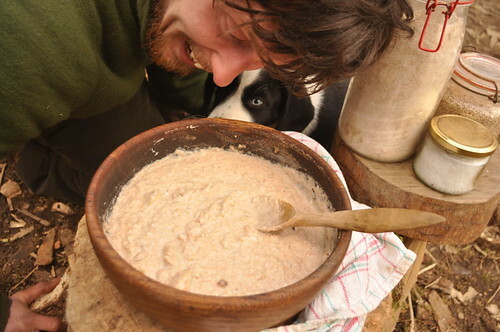 It turned our lumpy old porridge into an exciting and palatable treat, which we munched with joy. In fact, porridge bread was better than pure wheat bread, was softer and tastier, when made this way. The old porridge is thrown in a bowl, and the sourdough starter added. They are mixed thoroughly. At this point, replenish the (crucially) unwashed starter jar, with equal parts flour and water. It will soon be bubbling away again, ready for further use. Do not ever wash the container that holds your starter culture. The porridge/starter mix, once well stirred, can sit for the day, and even the night too. When the whole mix (or ‘sponge’) is bubbling, mix in a healthy pinch of salt, which helps the taste and structure. Also now add more flour, and any extras you fancy, like seeds or herbs. Add flour until the mix is too thick to stir. Drizzle this thick mix with good oil, and start to work it with the hands, keeping the dough moist. Knead it into a nice ball, that springs out when pushed in. This can now sit until it is wanted for use. We have found that more time waiting now, makes stronger better bread. When well-sat, it is time to turn the prepared dough into breads. Pinch off small balls of dough, flour your hands well, and squeeze the dough-balls, mush them about, until the consistency feels instinctively right, and you have imparted enough into it. Now roll them into a ball again, flour them once more, and slowly flatten them. There are many ways to do this, and you’ll doubtless find a way that feels like you’ve been doing it for years. These flat dough pieces can sit atop one another, in a bowl, if there is sufficient flour between them. Without a flour-buffer, they will squidge back into one lump together. To cook these breads perfectly, wait till your cooking fire is all done, and everything else is cooked and ready in their pans. You need the fire to be dying back, so plan for this moment during the whole cooking process. You may get your timing just right, or you may need to scrape embers to one side. When all flames have died back, and the embers are hot and well-spread, place the flat patties directly onto the glowing coals. If the flames are yet too strong, or you are cooking other things simultaneously, use a grill. Do not think that bread in ash is unclean. Yes, the bread will get ‘ashy’, but you can blow it off. Remember, as long as your fire has been burining only wood (no rubbish, firelighters etc. ), then the fire is the most well-sterilized environment for miles, cleansed at hundreds of degrees. Wood ash is perfectly clean. It is clean enough to put on open wounds. 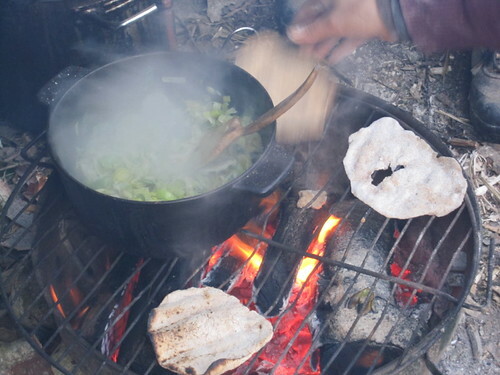 Throw the dough on the coals, for a minute or a few, depending on the fire’s heat. Turn and adjust them occasionally, until each side is well cooked. You know: let them cook, not burn. It’s simple. 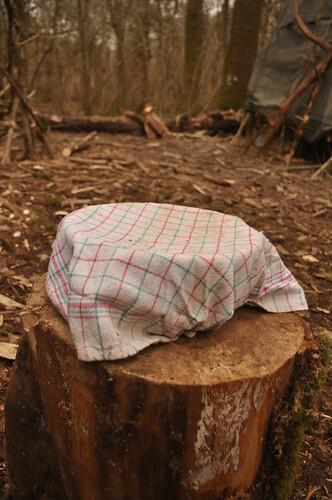 The breads will be ready at staggered times, in which case we tuck them into a piece of clean cloth, to hold in the common heat, until it’s time to dine. Sourdough takes much longer to make, and to activate, than bread made with monocultural shop-bought yeast. Making sourdough bread is more of a commitment than ordinary bread-making, taking a day or more, rather than a few hours. It is obviously a vastly different thing to picking a packet of bread off a shelf. If you get everything right, with a good hot spot to sit your mix, the entire process could take as little as…eighteen hours. At a push. The reason it is worthwhile: well, it’s tasty, in a way that the mouth doesn’t often experience nowaday. And it is very healthy too. Pre-fermenting the flour makes wheat far more digestible, as wheat is notoriously sticky for human bellies. A good bout of fermentation to kick-start the breakdown, and everything gets easier. There is also the added bonus of all the friendly family bacteria. 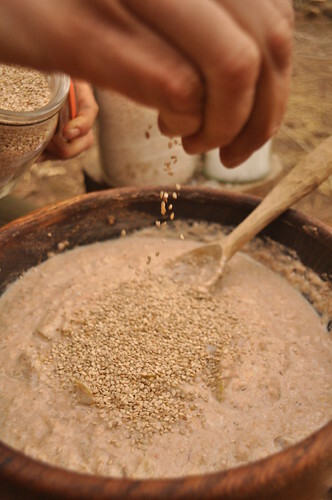 Some dietary historians claim that, in pre-mechanised supply chains, all grains were fermented before human consumption. The big change in bread-making came from the domestication of strains of yeast, which are used in isolation for most modern bread-baking, and with the increasing mass-markets, within which more consumers demand a single regular product, and things get more similar. Many medical experts believe that the change is not for our guts’ benefit. Our intestinal tract contains a kilo or more of diverse micro-organisms, busily at work helping us to digest. Without this non-human inner life, we cannot survive. Humans are not sufficient, isolated creatures. We are being constantly helped, encouraged, even permitted to live, by other organisms. Sourdoughs, and fermented foods in general, boost this inner symbiosis, putting good bacteria in the best places. And it costs no more than air. Common household fermentation methods need to be recalled, for our intestinal betterment. 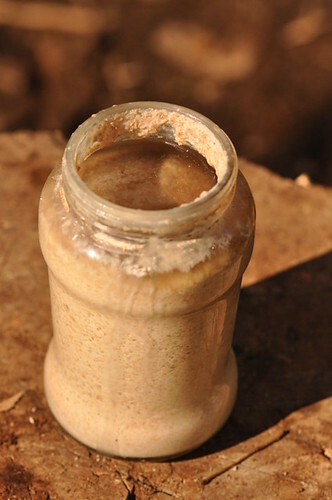 Many cultures globally enjoy fermenting traditions, like Ayrag, from Mongolia, an alcoholic horse milk drink which is the everyday national tipple. It used to be so in Britain. 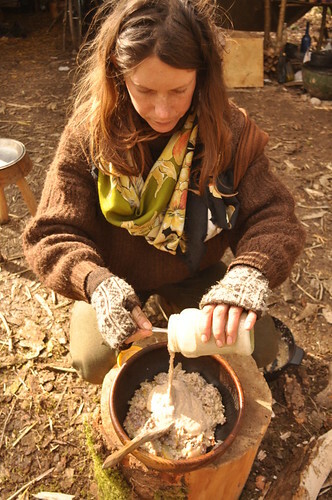 We heard stories that families, when emigrating to America, would carry only their tools, their clothes, and their sourdough starter culture, for basic survial needs. 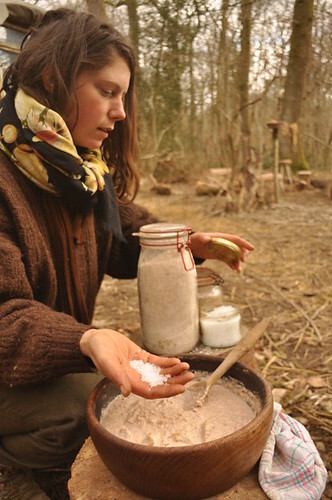 Why not revive healthy traditions, and start your own sourdough culture? It is easy to share, with a mere teaspoon of a living starter culture in a jar of flour and water. And your culture will improve with age, as it gains experience, and as certain local yeasts start to thrive over others. So give it a go. Spread it about. And enjoy eating good bread. 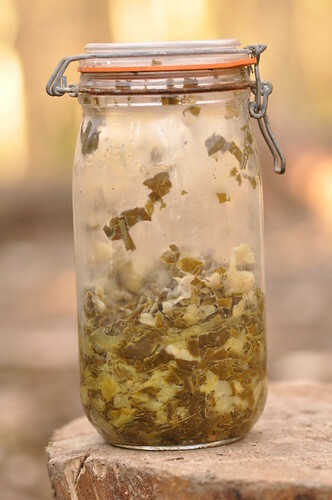 A wondferful resource for fermenting is: Sandor Katz’ book, ‘Wild Fermentation’. Also recommended, is Sally Fallon’s lovely cookbook, called ‘Nourishing Traditions’.